Decals: 2 letter-size sheets, ALPS-printed waterslide. Overall Rating: 9 - this is one model that will dominate the display area. 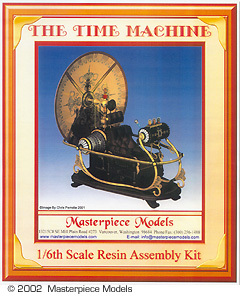 Masterpiece Model's second full kit is a 1/6 scale rendition of the Time Machine from the classic 1960 George Pal film of the same name. It is intended for experienced model builders, though someone with a bit of resin kit assembly experience -- and the patience and the courage to tackle the subject -- should be able to complete the project. The first thing I noticed when the package arrived is it's heavy - there's a good 5lbs or so of resin and other materials in there! Aside from a small baggie containing screws and wires (which had somehow come open in transit), all the pieces were packed loosely inside a veritable sea of packing peanuts, which made finding all the bits and making sure none had absconded through a gap in the bottom of the box a challenge. There's at least fifty resin pieces, three sheets of styrene, plexiglass for the base, decals, instructions plus various fasteners. Resin parts make up the bulk of the model. Cast in a medium-hard resin (i.e. easily-sanded, but not so soft as to be easily damaged), they exibited zero defects (pin holes, pits, misalignments between halves). However, there is quite a bit of paper-thin flash and some small mold seams. There will be a fair amount of work necessary to prepare the parts, but pretty much all of that will be in removing the parts from their pour stubs (the parts that are attached to stubs, anyway). Most surfaces are smooth, with little detailing. This fits well with what I've been able to find in visual references of the filming prop. The "time dish" piece is covered with rivets - all of which were crisply cast on my sample. Besides the resin, you get a pre-cut acrylic tube for the time display, several thicknesses of sheet styrene with which to make the base, various fasteners, wire to make coils from, various short rods and extra stock to make rivets from, in case the detailing on your kit is damaged or incomplete. All of these parts are listed and described in the first page of the instruction booklet. The instructions are very well done. The assembly sequence is logical, and each step is very clearly explained over the next six pages. A blueprint sheet is provided that diagrams how the assemblies are supposed to look. In cases where a part is hidden from sight once built, there's a diagram in the instructions to show how it needs to be made. Also included are four full-size templates for use in cutting and shaping the "wooden" supports for the machine and the base for the model. A large color photo print of the finished model, along with the suggestion to rent the movi, is all you get for a painting guide. 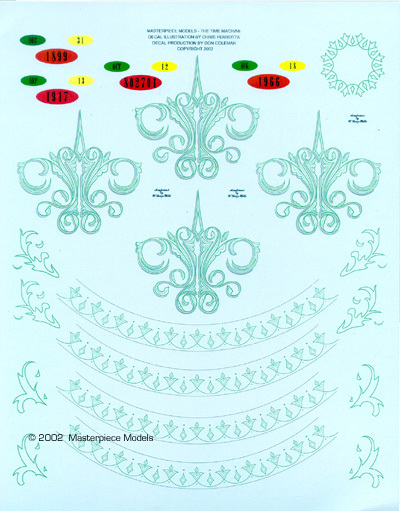 Finally, there's two full sheets of waterslide decals. These were printed on an ALPS (so they could get the metallic gold colors). The images are very crisp and very intricate, and covered in a continuous carrier film (so you'll need to trim close to the edge of each image when cutting them out. As far as I can tell from the images I've been able to dig up, yes. I'm not an expert, and I've never seen this particular film, so I honestly couldn't say whether every last detail is there and accurately rendered. However, the parts sure look like what they're supposed to be to my eyes. This is an impressive model, in the box. It's not for the faint of heart or the newbie, but anyone with intermediate skills and some experience working with resin should be able to build this kit. The high price will discourge some folks, but I have seen more expensive kits where one gets far less. You certainly get your money's worth in the quality - and quantity - of the parts and pieces. Recommended for intermediate and advanced modelers. Coming soon from Masterpiece Models is an electronics kit to motorize and light the model. You can also buy an assembled model - visit their website for details. The kit is also available through SCI-FI STATION, The Time Machine Project and Monsters in Motion. Many thanks to Masterpiece Models for providing the review sample. Manufacturers and retailers, interested in getting your wares reviewed and publicized on a site averaging 2000+ readers a day? Contact us! This page copyright © 2002 Starship Modeler. Last updated on 27 July 2002.